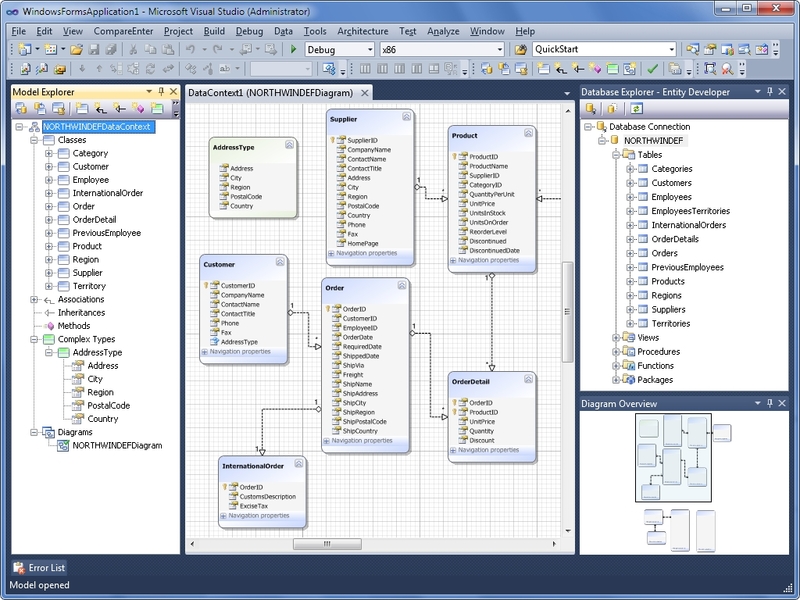 ORM solution, ORM, object-relational mapping, data access layer code, LINQ to SQL, LINQ to SQL technology, datasoft LINQ to SQL technology, and supporting SQL Server, Oracle, MySQL, PostgreSQL, and SQLite. LinqConnect is an actively developed ORM solution. We keep on improving our product and adding new features based on user feedback. LinqConnect includes the Express Edition of all supported dotConnect data providers, visual model designer - Entity Developer, and SQL monitoring tool - dbMonitor. With Entity Developer all the model creating and editing tasks can be performed in convenient GUI, completely eliminating the need of the manual XML editing, thus greatly reducing the development and learning time. LinqConnect uses classes and interfaces completely compatible with LINQ to SQL, while extending its functionality, so LINQ to SQL developer can easily get started to work with LinqConnect. Prof-UIS is an easy-to-use MFC extension library that enables you to deliver Windows applications with a professional and user-friendly interface.